Well, yes. People do love fairy tales, and they shouldn’t feel abashed about it. For what is a fairy tale but a ritual road map to success in life? For all that the form’s critics complain about its simplicity and formula and lack of realism and — gasp — mere escapism, a great deal is happening beneath those pretty surfaces. A good fairy tale, or in the broader sense, a good fantasy, is both pragmatic and idealistic. It tells us that all does not run smooth in this troubled world of ours: there be wolves in the woods, and witches bearing apples. It also tells us that, although evil may hold an entire world in its grip for a time (a hundred years, in the case of The Sleeping Beauty; untold generations in the great fantasy of the 20th century, Tolkien’s The Lord of the Rings), and although good people may suffer and even die in the process, eventually good will win out — inevitably, through great if reluctant courage and the power of love. Its casual, even eager, suspension of the laws of physical nature suggest the profound discovery that a good deal of any person’s life swims in an elusive lake of time and thought that is separated from the world that we can see and touch. It’s a place unknown, usually, even to ourselves, and realism doesn’t allow us to visit it. Contrary to a good deal of critical opinion, fairy tales aren’t usually Panglossian. This is not the best of all possible worlds. It is, however, a world that in spite of its own worst impulses holds out hope. Happily ever after? Well, for a time. Until Arthur dies, or Sauron rises, or the barbarians arrive at the gate. Fairy tales speak in metaphor, in parable, in fable. No, this isn’t realism: it’s the ground beneath realism, and the hope above it. The resolution — the princess awakened, the dragon vanquished, the poor but clever boy proclaimed a king — is a vision of optimism: things can be better than they are. It won’t be easy, but then, what worthwhile is? And without an ideal, how can we know what we want to become? So, charm us, Princess Aurora and Prince Florimund. Protect us, Lilac Fairy. You remind us of what we still might become. Martha Ullman West, Art Scatter’s partner in journalistic crime, has already reviewed The Sleeping Beauty smartly in The Oregonian, and we have little to add to her report: it was a lovely, aesthetically memorable evening. 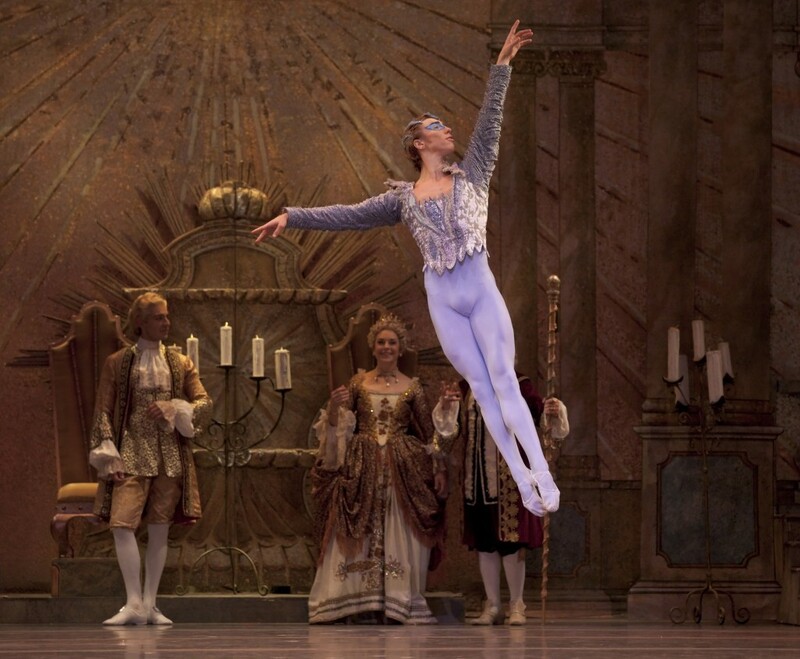 This world premiere production is choreographed by OBT’s Christopher Stowell in the manner of the ballet’s great originator, Marius Petipa (it premiered at the Mariinsky Theatre in St. Petersburg in 1890, which makes it four years older than Princess Aurora, who after her 100-year nap emerged 116 years old), and it’s tough to tell after all this time how much is Petipa and how much is Stowell. So much of this sort of re-creation is educated guesswork, the result of an extremely limited amount of notation and several generations of muscle memory passed down, no doubt errantly, by performers who learned from performers who learned from the ones who did it first. Either way, it’s a gorgeous piece of dancemaking, almost scarily attuned to Tchaikovsky‘s steely yet generous score, and Mr. Scatter was especially taken with the smooth three-point landings of the dancers’ movements as they syncronized their snap-stops to the end of each long line of music. He was also greatly pleased with the costume and scenic designs, both by Peter Cazalet, originally for Salt Lake City’s Ballet West. They radiate a baroque giddiness entirely apt to the time and fancy of Charles Perrault, the fantasist who published The Sleeping Beauty in 1696, and to Louis XIV, who ruled France at the time. Louis, a great lover of art and beauty, was known as the Sun King, and the back of Cazalet’s set is like a sunburst. 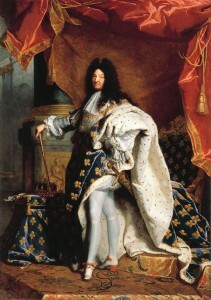 And Aurora’s father, King Florestan, wears lavish curls remarkably like the ones that Louis models in Hyacinthe Rigaud‘s 1704 portrait of him, shown above. Did the Sun King create the best of all possible kingdoms? Hardly, especially if you were a soldier or a soldier’s victim in one of his many wars, or among the multitudinous dirt-poor of the French nation. No happily ever after for them. But he did offer an ideal, a vision of what perfection might look like. We need the vision, as we also need the cries of dissent declaring that we’ve fallen short of it, or even that this vision is the wrong one. That’s something to dance about.